There’s a reason why I love the Humble Bundles. Not only does it allow me to buy games I like for next to nothing. It also allows me to choose how much of the amount I want to go to charity, thus making me feel like I’m not spending all of my money just on games. Yesterday there was a Daily Humble Bundle containing the EvE Online Starter Pack. Despite me having multiple accounts already and having a few on hold, I bought one. I can’t pass up on deals like that and for little over 3 bucks I got myself a nice starter pack and a skin. If I had paid a bit over 20 I could have gotten a PLEX from it too but I’m not a big fan of paying for my Plexes with cash. I’d rather use ISK for that. Now that I have another key, to create yet another account, I just need to decide what I want to use it for. I can train something, I can do something.. But what. Maybe I should finally do roams in Low with a low SP alt. That could get me some fun, right? Last Saturday I spent a few hours making a spread sheet about my invention. Not even all kinds of invention but the invention of 1 kind of item. I’m hoping that said item will bring me a nice profit in a few weeks once I’m done creating copies of my Blueprint Original. Seeing that you need Blueprint copies to invent them into T2 copies. The reason why this took me a few hours is because of the fact that I had to make a list containing all the products I need for the invention and creation of this. Then I had to breakdown said list into all the raw material I would need for this. After doing that I remembered that I already had a bunch of material around somewhere so I had to put those into my calculations too. And let’s just say that it’s been awhile since I had to test my math skills. For some reason I came to amounts of 5m ISK more than I should have, but I accidentally multiplied somewhere instead of making a sum and well, it took me a bit to find said error. Along with all of this I also made a few additions to my POS. I added a few extra labs for more copies and I asked a friend if he wanted to join me in my little venture. I bet that if it were in any way possible, he would have had ISK signs in his eyes. But that’s a good thing, it’s more fun if you work with multiple people on a project. And speaking of projects, I have decided to say farewell to null sec. I had tons of fun there but it just wasn’t my cup of tea. Logging in, hoping for a fight and having to wait because fleet command was going to take dreads out first while I was sitting there in my little cruiser was not something I liked. Despite getting a bunch of fun fights, they were too spread out for me to stay there. So I went back to High Sec and am currently sitting in my Machariel wondering what to do. I’ve been thinking about maybe going to Low Sec. I just need to find someone willing to take me in. A Noob with little experience in PvP. Because, let’s face it. The only reason why I survived so many fights is because I followed people around and was pretty lucky most of the times. A few days I went on a Talwar roam, my last roam with the alliance I was in and after a few hours I decided to head home. I have no idea how, but I was able to get past a gate camp in my Talwar with about 80% hull left. That’s what happens if you go home alone, instead of breaking up gate camps, you are their victim. Lucky for me everyone had engaged me so nobody could jump after me to finish the deal. So I made it home safely, only to put the destroyer back on contract, grab myself a Claw and head 22 jumps back to my High Sec home. I guess I’ll be running missions while I wait for something to drop in my lap. Or maybe I should go out searching actively, if only I knew what it is I want. Well, that’s it for me, I not longer have any T2 BPC’s to manufacture. One of my biggest problems due to lack of time in EvE is that my T2 manufacturing is taking hits from it too. I’m making a profit, but my profit isn’t big enough, I made about 500m after expenses in April. That’s not nearly enough to make me happy. And unfortunately I don’t see it changing in the near future. The answer to that is Trading. But I don’t feel like trying it again. Despite the fact that if you’re good at it, you don’t have to spend too much time a day doing it (ten minutes or so). But that’s if you’re good at it, and I wasn’t. I made a profit, but I made it slowly, it took me about 2 months to make 1b out of 100m and another month to turn that 1b into 2b. Those numbers aren’t bad, to the contrary even. But I spent way too much time to get there. Instead of spending a few minutes, I spent a few hours a day updating orders, checking what to buy, what to sell. And I relocated four or five times in that timeframe. It wasn’t the fun I envisioned it should have been. But maybe I’ll try again, I have 600m on my trader that I’m not using and 14b on my industrialist. Guess I should make the ISK work. 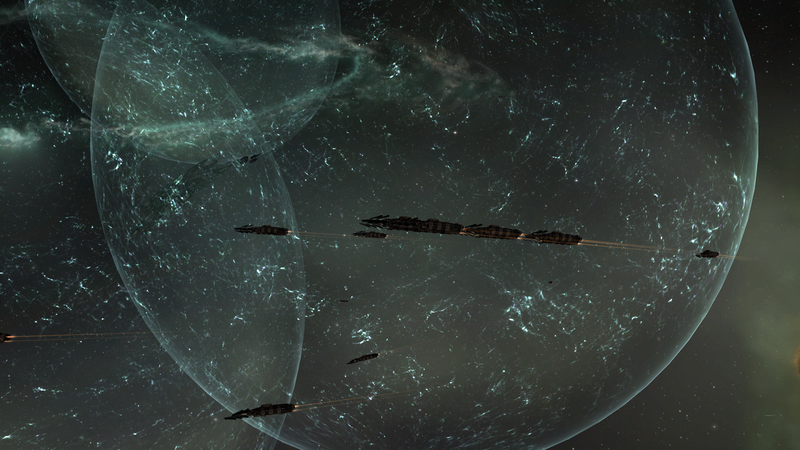 PLEX in EvE makes the virtual world go round. You can use it if you’re strapped for cash, by buying some with your Dollars, Euros, Yen, …Whatever it is you use, and then sell it on the market for ISK. The ISK worth of it right now is 710million, give or take a few. 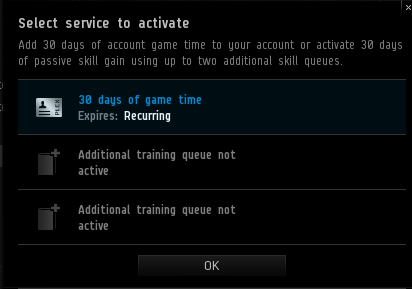 If you have the ISK for it, you can use it to pay for your subscription, one PLEX being the equivalent of 30 days of game time. You can even buy them and just put them someplace until they’re worth more than they are currently. Which is something that a lot of people have been doing since they just keep going up. I myself am guilty of this too. PLEX has other uses, there’s the Aura store that I know absolutely nothing about. There’s the dual training that’s rather new. I’m sure I left out a few things but there’s not many other games that allow you to use in game currency to buy things like this. Which makes me come to my little milestone. For the first time in my EvE carrier I have used a PLEX to prolong my game time. I’m pretty proud of myself. Not only have I used my ISK, I have stepped away from me not wanting to use said ISK on something for myself.